I served this salad with our Sunday dinner and it was not only really pretty, it was REALLY delicious too. The combination of flavors, textures, and colors in this pomegranate pear salad with candied pecans and shaved parmesan is wonderful! My husband and kids also thought this salad was delicious and it paired nicely with the chicken with white wine sauce with mushrooms and some creamy mashed potatoes. I have already decided I will be serving this salad with our Christmas dinner because it will be delicious with prime rib and will look nice on the table. Combine the vegetable oil, olive oil, apple cider vinegar, and honey together until well combined. Season with sea salt and freshly cracked pepper, to taste. Set aside to allow flavors to mingle. 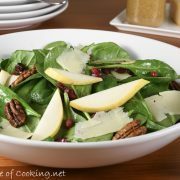 When ready to serve the salad, whisk the vinaigrette until well combined then drizzle some on the spinach, to taste. Toss to coat evenly. 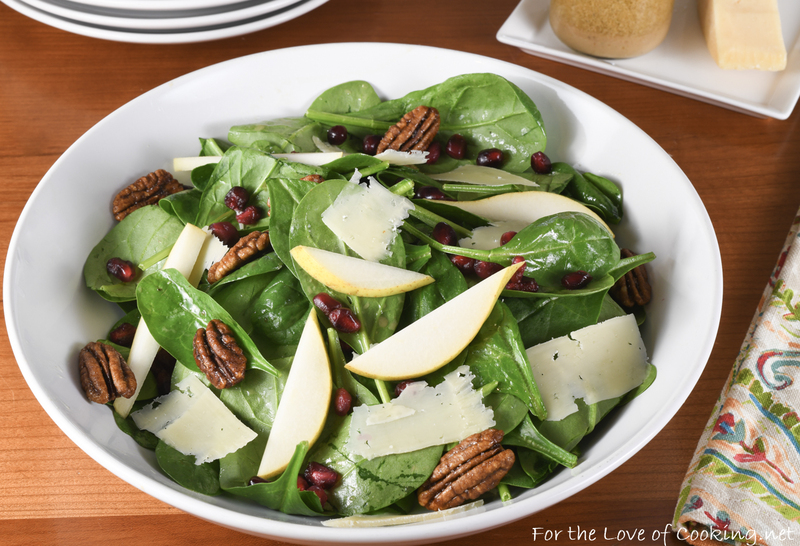 Top the salad with sliced pear, pomegranate arils, candied pecans, and shaved Parmesan. Season with freshly cracked black pepper, to taste. Serve immediately. Enjoy. 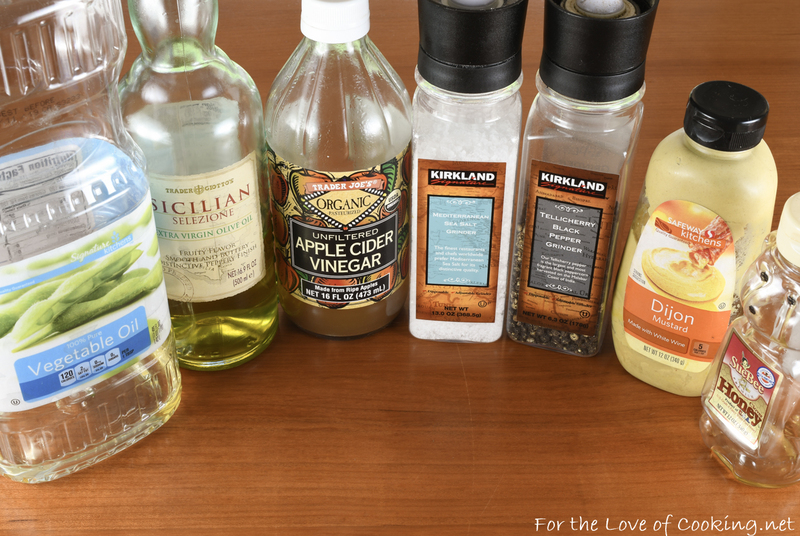 Make the vinaigrette by combining the vegetable oil, olive oil, apple cider vinegar, and honey together until well combined. Season with sea salt and freshly cracked pepper, to taste. Set aside to allow flavors to mingle. 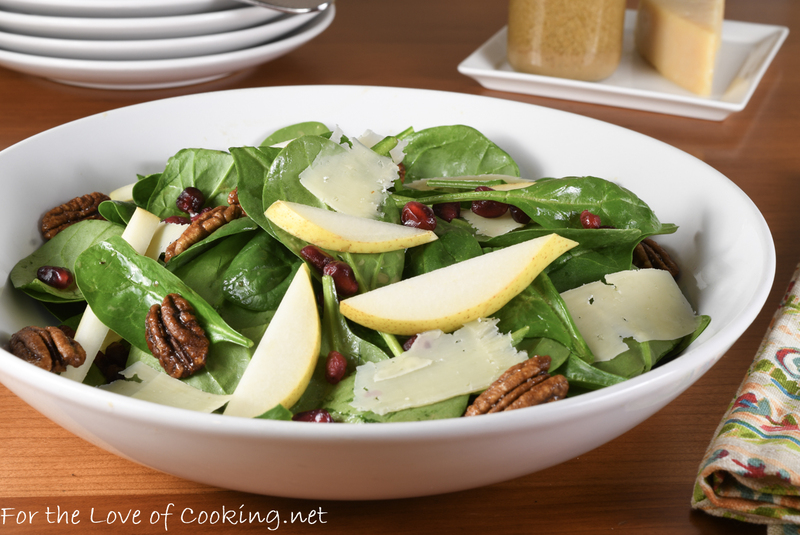 When ready to serve the salad, whisk the vinaigrette until well combined then drizzle some on the spinach, to taste. Toss to coat evenly. 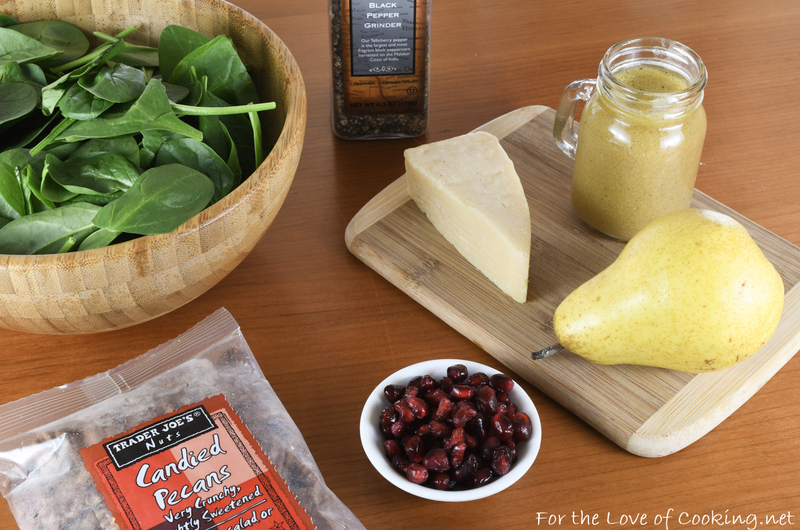 Top the salad with sliced pear, pomegranate arils, candied pecans, and shaved Parmesan. Season with freshly cracked black pepper, to taste. Serve immediately. Enjoy. So fresh and tasty…such a glorious winter salad! A very refreshing salad. Great combination. I love a salad with a lot of fun mix-ins. So much excitement in every bite!